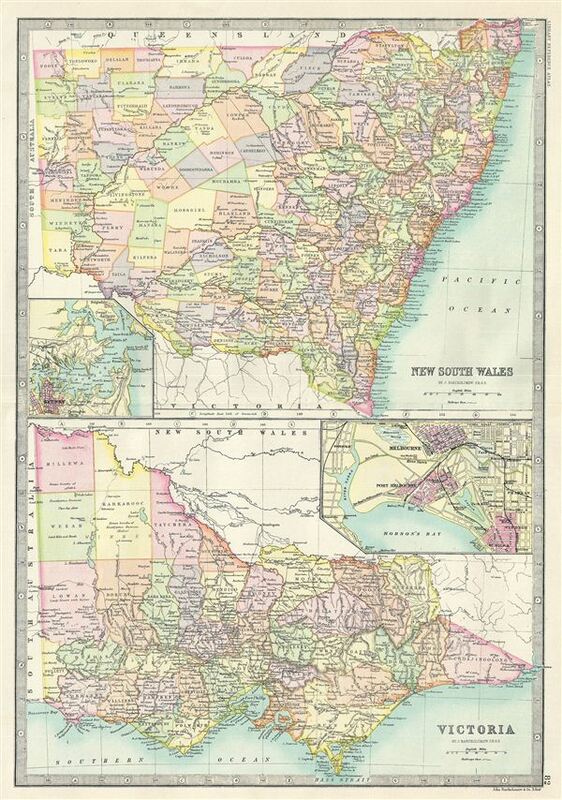 This is a fine example of Bartholomew's 1890 map of New South Wales and Victoria in Australia. The map is divided into two parts, with the upper map featuring the Australian state of New South Wales and the map on the bottom features the state of Victoria. New South Wales is covered in its entirety from the Macpherson Range to Auckland and includes an inset detailing Sydney. The lower map, featuring Victoria, coves the state from Millewa to the Bass Strait and includes an inset map of Melbourne. Both map are highly detailed along the coast line and are color coded according to regions and territories. Various rivers, railways, towns, cities, ports and several other topographical details are noted. Relief is shown by hachure. This map was issued as page no. 82 in Bartholomew's Library Reference Atlas.